Internal problems of Portland concrete–a mixture of Portland cement, stone and water–are often caused by incompatible stone aggregate, comprising around three-quarters of finished concrete by weight. Problem aggregates may contain clay, shale, dolomite rock, gypsum, sulfide minerals or chemically active silica that can can cause concrete to swell and crack over time. Some such damage may appear soon after concrete mixing and setting, but other damage can emerge years later. Costs of transporting heavy, bulky materials mostly limit concrete suppliers to local and regional sources. Using practical sources, they try to prepare mixtures that provide good strength and long-term reliability. In the Appalachian and Rocky Mountain regions of the United States, many sources of stone are igneous rocks that come from mountains dominating the geology of those regions. They have characteristic hazards. Latent problems: Portland concrete’s problems can appear as spalling breakage–notably around joints and edges–as pop-out fragments that dislodge from surfaces, as shallow cracks that are often nearly parallel and as deep cracks at different angles that intersect. The first three problems may develop in days to months from ineffective composition, mixing or installation. They can sometimes be repaired. A pattern of deep, intersecting cracks–sometimes called “map cracks”–that emerges years after concrete has set can indicate defects in materials, potentially leading to structural failure. Attempts to repair this type of defect often fail, as more of the deep, intersecting cracks continue to appear. These problems are caused by materials that slowly swell, overstressing and fracturing a solid concrete matrix. Problem types and tests: Some latent problems are related to stresses occurring in use. Those are provoked by variable loads on concrete structures–as experienced by pavements and bridges for example–or by changing temperatures, especially cycles of freezing and thawing. 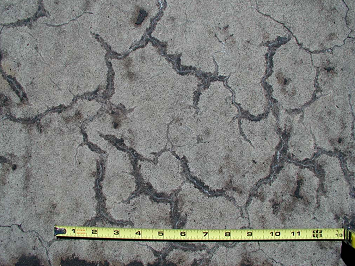 Many reviews address them under the heading D-cracking or “distress cracking.” In contrast, latent problems related to materials will appear when bearing loads and temperatures are nearly constant–for example, in a house foundation. Tests of compressive strength, typically performed about a month after preparing concrete, rarely reveal latent problems with materials. Despite decades of research and attempts at specification, So far there has been no single test method for qualifying concrete materials that fully insures against latent problems. The most effective guard against them is long-term experience with specific sources. Alkali reactions: Latent problems have been recognized since the 1930s that are caused by reactions of alkalis, produced by mixing Portland cement and water, with components of stone aggregates. They were first documented by the late Thomas E. Stanton, an engineer working at the California Division of Highways. The most common problem comes from reactive silica imbedded in stone aggregates. Stone of both igneous and sedimentary origin may contain reactive silica. Among igneous (and metamorphic) sources, it is fairly common in granite, gneiss and hornfels. It is not usually found in andesite, basalt, gabbro or tuff. Particle size is a critical factor, with fine sand sizes to small pebble sizes typically the most troublesome. Adding pozzolans, such as natural pumice or furnace fly-ash, can suppress effects of reactive silica. They combine with calcium hydroxide from Portland cement, reducing its alkalinity and strengthening it. Mixtures of calcined lime and pumice made highly durable Roman mortars and cements. However, the amounts of various pozzolans needed with different Portland cements and stone aggregates and the optimum concrete curing cycles remain in some dispute. A less common alkali-related problem can occur when dolomite–mostly magnesium-calcium carbonate–is a component in stone aggregate of sedimentary origin. Harmful swelling of afflicted concrete tends to be more rapid than swelling caused by reactive silica. Unfortunately, tests that help control reactive silica may not give reliable results with dolomite, and adding pozzolans does not help. Sulfides: Sulfides occur occasionally in igneous, sedimentary and metamorphic rocks. When a stone aggregate containing sulfides is used to make Portland concrete, it can cause latent problems by primary swelling and through oxidation to sulfates. Problems have been reported in Kansas, Kentucky, Missouri, Ohio, Pennsylvania and West Virginia. They were first documented in the 1960s by the late Richard C. Mielenz, a geologist and civil engineer who later served as president of the American Concrete Institute. Contamination of Portland concrete with sulfides is less common than with reactive silica and dolomite. It has received less attention. However, major problems developed in Canada, near Montreal, and in eastern Connecticut, near the town of Willington–affecting thousands of home and other building foundations. There is currently no known way to suppress problems with sulfides. Correcting damages often involves costly work to excavate and replace failed concrete. This entry was posted in Business, History, Projects on November 15, 2017 by Craig Bolon.